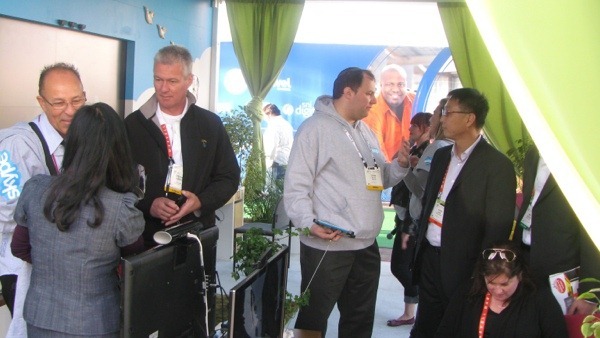 The Consumer Electronics Show is the industry’s largest international gathering that tends to take over Las Vegas for four days. 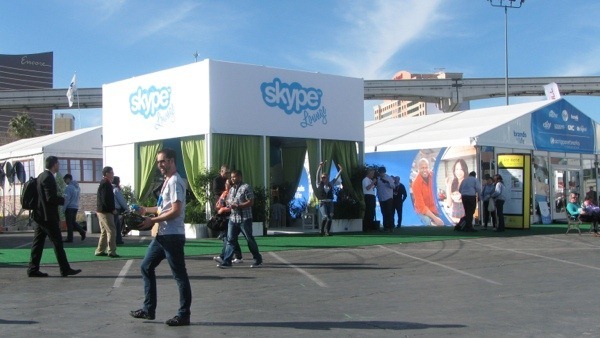 Skype at CES 2012 is rather low key this year with no press announcements, a small “open air” Skype Lounge in the Central Plaza in front of the Las Vegas Convention Center and a kiosk in the Microsoft booth. 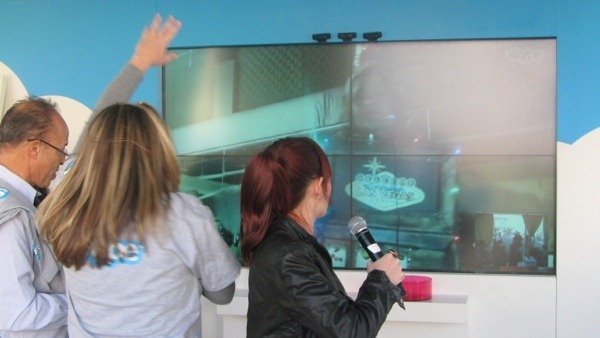 The Skype Lounge features a demonstration of the recently announced TelyHD Skype video calling for any TV set and Skype Video Calls on a large screen with various local Las Vegas locations such as a museum and some school attractions. Occasionally they get worked up with “jump time” throwing out free cell phone socks to passersby. The biggest issue here is visitor traffic; due to its location barricaded largely by a key roadway for shuttle busses and taxis, it’s a little like the barriers put up by an urban freeway. On the show floor so far I have seen Skype in the Logitech booth (new C920 1080p HD webcam), Blue Microphone with a unique USB microphone for laptops and NVidia where there is another TelyHD demonstration. I’ll have more to report on TelyHD after an interview later today. And our presence did get tweeted. 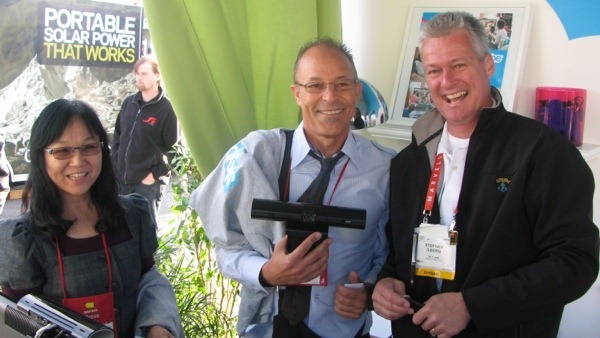 Bottom line: It is called the Consumer Electronics Show where the focus is on the business relationships behind end user experiences for consumers. 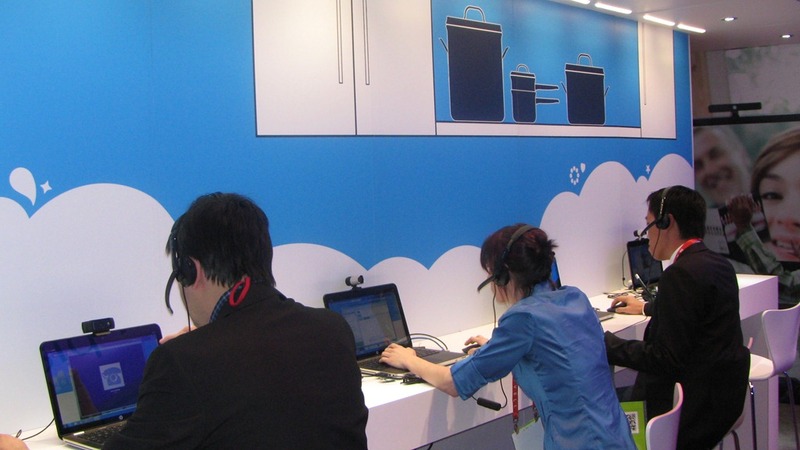 While Skype had no news announcements, they focused on demonstrating the user experience and applications of video calling. 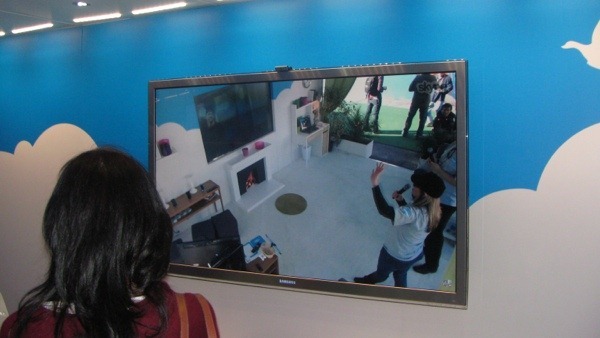 At the same time I suspect Skype is working out the path to its incorporation into Microsoft products – Live, Xbox/Kinect, Office, Windows Phone, etc. And we’ll hear about it at some Microsoft -sponsored event – tying in with their reasoning for dropping out of CES as both keynote and exhibitor.